Peripheral nerves are bundles of axons which carry signals to and from the brain. These axons are bundled together into a peripheral nerve. 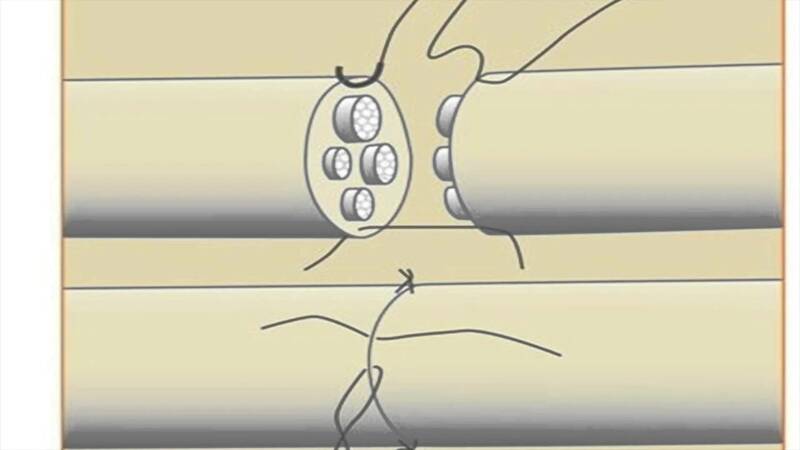 The nerve has specialized connective tissue between the bundles and around the nerve. A cross section of a peripheral nerve showing the axons, groups of axons creating a fascicle, and groups of fascicles which compose a peripheral nerve. Myelin is the covering of both the peripheral nerve and axon. The covering accelerates transmission of signals and also insulates the nerve from outside. Injury to the myelin sheath can inhibit both of these functions. Nerves can be injured both by compression, blunt trauma, laceration or electrical injury. The duration and severity of the injury typically determines the impact upon the nerve. Mild compression injuries cause bruising of the nerve or neuropraxia. Patients with neuropraxia may complain of pins and needles feeling. Severe forms of neuropraxia may also exhibit muscle weakness. Nerves which sustain greater amounts of blunt trauma, stretching or laceration may exhibit axonotmesis. In this situation the nerve does not conduct electrical signals distal to the injury. Patient’s symptoms include numbness in the area distal to the nerve injury in the distribution of the nerve. Patients will also exhibit no muscular contraction of any muscles innervated by the peripheral nerve. After reviewing your symptoms and history, your surgeon may delve into any related family or medical history. After this, a detailed examination of the extremity is performed. The location of any lacerations or fractures and their relation to the course of the nerve is noted. An examination of the sensation in the distribution of the nerve is determined. Your surgeon may use test to determine the ability to discriminate between two points or sharp versus dull. An examination of motor function is undertaken and the surgeon typically grades the ability of the muscle to respond on a scale of 0 to 5. For peripheral nerve injuries, imaging typically is not necessary. At times advanced imaging may better delineate fractures or dislocations, but typically the structure and status of the peripheral nerve cannot be determined by imaging exams such as CT or MRI. Electrophysiological tests evaluate the ability of the nerve to conduct electrical signals and the ability of muscles to respond to these signals. It should be noted that as in all tests, both false positives and false negatives are present. Therefore these tests are ordered to confirm the presence of nerve injury. However, these tests by themselves neither diagnose nor rule out nerve injury. These tests may be conducted by your hand surgeon or these tests may be performed by a neurologist. For injuries associated with neuropraxia (stretching the nerve), observation is typically the most common course. The recovery of peripheral nerves to injury is heterogeneous. The results depend on the amount of injury, how far away the innervated muscle or skin is from the injury, and certain nerves give better recovery. At times, some surgeons may use observation only, or may encompass hand therapy for splinting and exercise. Repeat electrophysiological tests may give some indication of nerve recover. Most peripheral nerve surgery can be completed as an outpatient surgery and the majority done under regional anesthesia. For most patients, blood loss is minimal and unless there are medical indications—prophylaxis for deep vein thrombosis is not necessary. Other risks of surgery are small and include infection, bone healing, tendon rupture, and stiffness. As noted above, nerve recovery is slow. Modern nerve repair surgery has greatly improved the lives of many patients. However, nerve repairs in adults never reach the exact same level of nerve function as the preinjury status. Nerves with mixed function may have less predictable results and improvement can occur for up to 18 months.